When is a petition, a BIG petition? A colleague asked recently – what I’d consider a ‘big’ petition number. Putting aside the discussion about the role of petitions in campaigning and their effectiveness, plus the reality that a big petition is so dependent on the context that it’s being used as a tactic for – if you get 1,000 people in a village of 2,000 to call on the local parish council to take action on something then I’d argue that’s a ‘big’ petition. But given the discussion was about influencing Westminster and Whitehall, I decided to dive into the data that’s available on the Parliament Petition site. It’s a site that I’ve had misgivings about in the past, but one thing in its favor is that it does make the information really easily accessible by allowing you to download it in a format that means you can manipulate the date. The Parliament site already sets some suggestions of what it considers to be a significant petition – if you get 10,000 people to sign you’ll get a government response, and 100,000 could mean that the petition will be considered for a debate. So working on an assumption that anything that gets over 10,000 must at least get on the radar of the relevant Secretary of State or Minister – because presumably, the response gets put in the ministerial red box, and if it’s 100,000 they need to attend the debate, so I decided to look at every petition that had got over 10,000 signatures since the start of the current Parliament – a total of 165 petitions when Parliament went into recess for the summer (the number is now at 174). I’ve made the whole dataset available to download here. I went through each response to code them against the government department that was asked to respond as a way of identifying who they targetted. 1 – There is a very long tail – even when you’re looking at just those petitions that get over 10,000 signatures, it’s very much the case that you find a few petitions with very large numbers of signatories – there are 4 current petitions with over 200,000 signatures. 2 – Some departments receive lots more petitions than others – Officials at the Department of Health, Home Office and Department for the Environment have been kept busiest having to respond to the most petitions over the last 18 months, each dealing with over 25+ petitions, compared to just 1 for DFID, Northern Ireland Office, Minister for Equalities and Leader of the House (who had to respond to a petition about subsidised meals in the House of Commons). The average for a department is 6. 3 – Getting over 50,000 is a significant milestone – there are only 7 petitions in my dataset that are between 50,000 and 100,000, 22 which have gone beyond 100,000, and just 4 over 200,000 – so 20% get over 50,000. Of course, the challenge here is that officials and ministers are only obliged to respond when the petition hits 10,000 or 100,000, but if you’re looking for a sense of what’s a big petition then anything over 50,000 feels like it is. 4 – Looking for an average number? Then this really does differ by department, with the average number of signatures that get on to the radar of the relevant ministerial teams going from around 20,000 for departments like Transport or the MoD but up to closer to 75,000 for the Treasury and over 100,000 for BIS. The Department of Justice has the highest average of 115,000 but that’s based on just two petitions – one of which has got over 210,000 signatures. 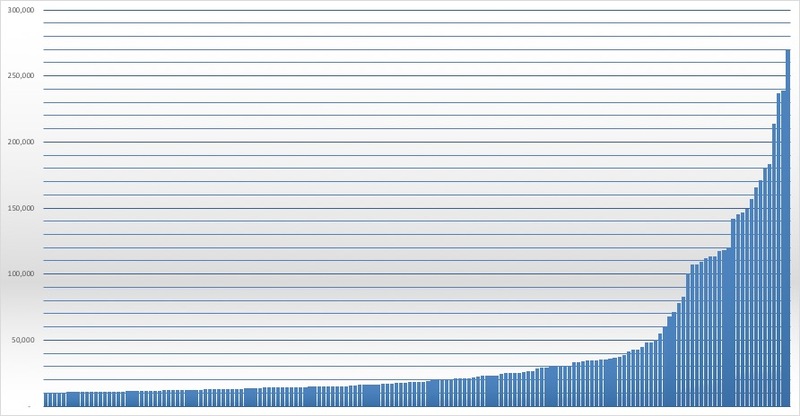 If you’re looking for an average number across government then the mean average is 39,932 and the median average is just 18,189 – which shows the impact of the handful of very large petitions on the overall total. So what makes a big petition? Well with lot’s caveats, but from the data, I‘d suggest that anything over 50,000 could be considered a big petition to the government. It’s a clear milestone that most petitions don’t get over and it’s a number that can’t easily be dismissed as an ‘average’ number, but I’d be interested in what other readers think. Interesting read and thanks for crunching those numbers! 1. A useful part of the petition process is the “hand in” – if done well this can generate publicity for your cause. My team just handed in an open letter to Downing Street with 17,000 signatures which was covered in The Times. If you go down the gov.uk route, I think this may be harder to do? 2. 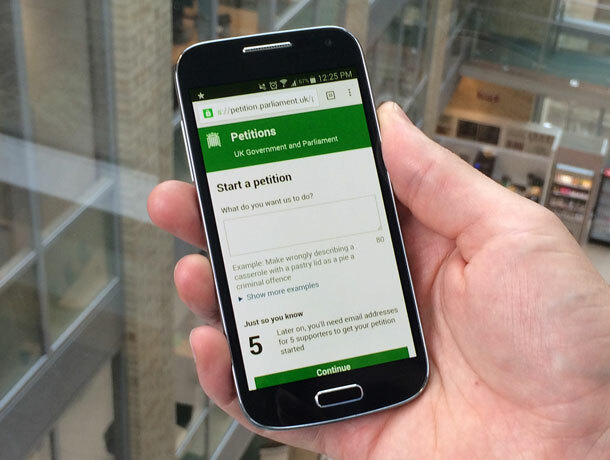 In addition, how do you keep track of who has signed the gov.uk petition, and keep signatories informed about the progress your campaign makes? My assumption would be that if you collate signatures yourself, then you have more control over this (assume you obtain the correct permissions of course). And hitting 100,000 is no guarantee of a debate.